Disclaimer: I received a free meal from Roti Mediterranean. Financial compensation was not provided. All reviews and opinions expressed in this post are based on my personal view. Do you have a favorite take out place? My husband and I don’t go out to eat very much but with a new baby, there are some days that take out is simply necessary. There are only a few places nearby that offer vegan options for us such as Chipotle and Blaze Pizza but over time we have been disappointed in their food quality and flavor of both chains. 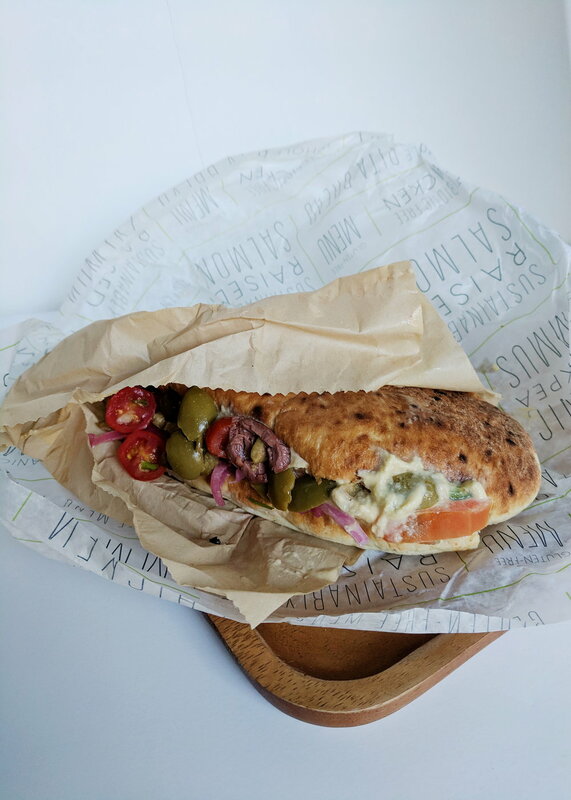 When we discovered there was going to be a new fast-casual spot opening up nearby, Roti Modern Mediterranean, we were excited to give it a try! Roti has become our top choice for take out. In fact, it’s been the only take out place we’ve been to for several months now. Part of it has to do that the majority of their food is vegan-friendly and more than anything, their fresh and tasty food keep us coming back for more. Roti is also affordable, which is always a plus when it comes to take out. You can also order ahead on their website or user-friendly app (and earn rewards!). The beauty of Roti stems from their build-your-own experience choosing a rice plate, laffa wrap, pita sandwich or salad. You can customize your base with any protein, side(s) and sauces. All of their bases are vegan. So whether you decide to go with a rice plate or pita sandwich, you can be certain they meet your plant-based eating pattern. Their falafel is the only vegan option they have for protein but it’s also gluten-free which allows more people to enjoy it. All of their sides and toppings are vegan as well, for the exception of feta cheese, so it gives you endless possibilities to create a delish dish. Take a look at their menu here and their allergy guide for more insight on vegan-friendly and gluten-free options. I always go with their rice plate, falafel, tomato & cucumber, red cabbage slaw, Za’atar kale salad, hummus, pickled onions, olives, and top it off with their spicy red S’hug sauce. Super tasty and so filling! My husband gets something similar and other times he’ll get a pita sandwich with similar toppings. The pita sandwich is a great choice too! Roti isn’t your typical fast-casual and/or take out spot. It’s unique in that their fresh, clean ingredients and options cater to all dietary lifestyles. They are also transparent about their food. They claim that their falafel is “crispy on the outside, but never dry on the inside” and time after time of visiting Roti, my husband and I have found this to be true. What I enjoy most about Roti is that each of their side dishes are individually flavored, so no matter what sides you decide to incorporate into your meal, you’ll be sure it’s tasty.